"This is a good day to speak about players who played," Emery said with a forced smile, clearly trying to change the subject. For Emery, the Ozil problem won't be going away any time soon. The German playmaker is Arsenal's marquee star, and its highest paid player at a reported 350,000 pounds ($450,000) a week following a contract extension seemingly hastily offered soon after Alexis Sanchez left the club midway through last season. On his day, he can do things few others can — his imperious display against Leicester in October was evidence of that. But that isn't enough for Emery, who isn't indulging Ozil like his predecessor as Arsenal coach, Arsene Wenger, used to. Emery dropped Ozil for last week's 2-1 win at Bournemouth because he didn't think the player was suited for a "very demanding match with physicality and intensity." 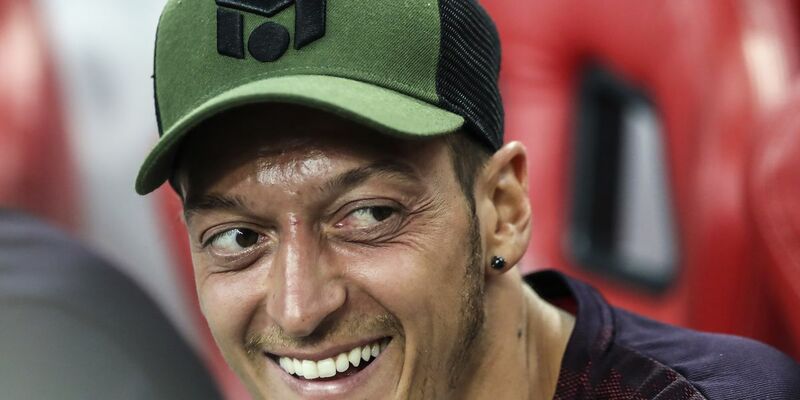 That was the third league game Ozil had missed this season, with Arsenal citing illness and a back spasm as the reasons for his other two absences. Arsenal isn't missing Ozil when he is not there. In fact, the team is thriving under Emery, fourth in the standings and unbeaten in 12 league games since opening the season with back-to-back losses against Manchester City and Chelsea. Arsenal's undefeated run in all competitions has stretched to 19 games. Arsenal has developed a strong and coordinated pressing game under Emery that proved too much for a Tottenham team that was suffocated and ultimately overpowered at Emirates Stadium. It's hard to imagine that pressing game would have been as effective if Ozil, who does his best work on the ball, had been part of the effort. Alex Iwobi and Henrikh Mkhitaryan don't have the same talent as Ozil, but they are more hard-working and apparently more trustworthy. It would be no surprise if Iwobi and Mkhitaryan started again in Wednesday's Premier League game at Manchester United. Arsenal's board may have a big decision to make in a few weeks, with the midseason transfer window opening on Jan. 1. Would it be in Arsenal's interest to sell Ozil and maybe get in a replacement that better fits Emery's approach? Would Ozil even want to leave, given the money he earns at the London club? In the meantime, Emery will just have to get used to the weekly barrage of questions about Ozil. It's a week of reunions for Claudio Ranieri following his return to the Premier League with Fulham, and the upcoming one will surely be the most emotional. After taking his new team to former club Chelsea for a 2-0 loss on Sunday, Ranieri is now preparing to come up against Leicester — the side he led to an unlikely title triumph in the 2015-16 season. Ranieri recently visited Leicester's King Power Stadium to lay a wreath as a mark of respect to the club's late owner, Vichai Srivaddhanaprabha, who died with four others in a helicopter crash in October.